Our Early Years Foundation Stage (EYFS) Curriculum follows the updated revised statutory framework that sets out children’s learning and development in the Foundation Stage. It outlines a broad range of knowledge, skills and understanding that provides children with the right foundation to make good progress through school and life. Here you’ll find an easy to read parent’s guide to the EYFS framework. 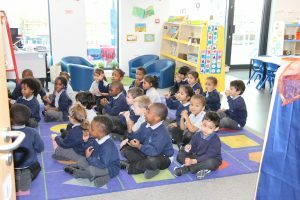 Our reception children will acquire knowledge, skills and understanding in the following seven areas of learning and development. The prime areas are fundamental, work together, and move through to support development in all other areas. These three areas reflect the areas used in healthy development reviews by health visitors when children reach two to two-and-a-half years of age. In addition to these areas of learning children are taught French once per week. Observations take place daily and significant achievements are recorded in the children’s Profile Folder. Parents are invited to make comments and observations about their child and this is included in the child’s Profiles. 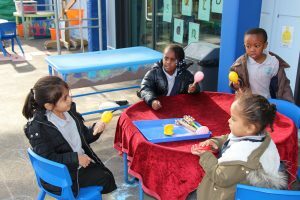 The children in the Reception class are assessed throughout the year using Development Matters Ages and Stages. At the end of the Reception year the Early Learning Goals are used to determine their progress in the Early Years Foundation Stage and to inform the Year 1 teachers of their starting point. We offer a full time 30 pupils in Reception each academic year.